What if you were asked to think of six words to summarize what you believe is most important? Interesting, challenging and exactly what my 14-year-old son was asked to do in school last week. To be honest, I didn’t really know what to expect. He is an outgoing and positive kid who has a gift of seeing things through the lens of possibility. 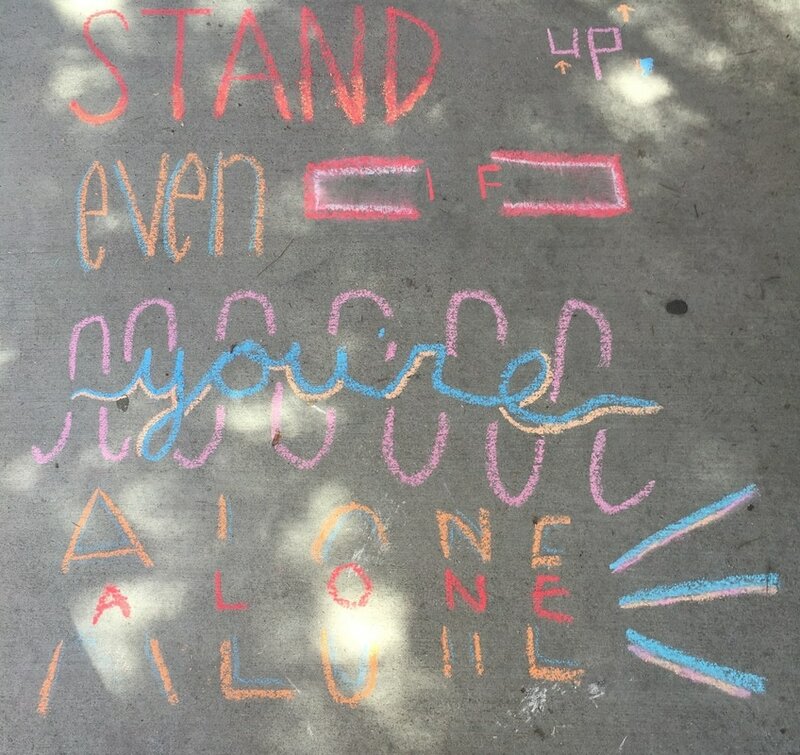 When I saw what his six words were: “STAND UP EVEN IF YOU ARE ALONE” I was impressed and surprised … wow! Very deep words for such a young guy! As a parent it pleased me, to see that the values that my husband and I talk about where actually being heard. We often talk to both of our sons about the importance of doing the right thing even if it is hard or unpopular, even if you are “alone”. My hope is for them to become men who keep their word and do the right thing when no one is looking and no credit is given. In addition to making me feel both relieved and proud that our words were being listened to, his six words made me wonder if I could crystallize what I believed into a mere six words. So much of our time is spent running errands, making sure the house is in order and everyone has what they need. What if our focus was on our “why”? Your “why” is what is MOST important to you and in our busy lives, this often gets forgotten. What would your six words be? Please share them in my comments section. Act Now For Your Best 2017! There is something so appealing about a new start. Beginning that new diet on January 1st or waiting until after the holidays to commit to an exercise plan is what most people do. They wait until the new year to make their goals and set their intentions. I believe that by waiting until the new year to plan our goals, we are throwing away the valuable information that the last 12 months can offer. Evaluating the past year can greatly improve your chances of succeeding in your goals for next year. What were you proud to have accomplished in 2016? Maybe you spent more time with friends or read more books. Thinking about how you made those goals happen can put you in the right frame of mind to make your new goals possible. It will also remind you of what you consider important and valuable and help you to cultivate those habits to make them a permanent part of your life in 2017. What were some mistakes or failures that happened to you in 2016? It’s hard to look at mistakes but, it’s essential to identify what went wrong. Most importantly, what can we learn from those mistakes to insure they are not repeated. “Failure is simply the opportunity to begin again, this time more intelligently,” Henry Ford. While it may sometimes be embarrassing or difficult to look at your mistakes, it is a valuable way to help you plan what you want in your life going forward. What would you regret NOT doing in 2017? We sometimes go through life as if we have all the time in the world, when the truth is we don’t know what day could be our last. Think about some of the goals you’ve always wanted to accomplish: Do you want to run a marathon? Have you always wanted to sing? Do one thing that will give you more information on a nearby race or Google “voice lesson” to find out where the nearest class or teacher is located. Start now, in 2016, and by the time 2017 is here you will have a plan and not just a wish. I know that the holidays can be a busy and hectic time. But, taking a few minutes during the last few days of December will help make your New Year’s goals and resolutions more successful. Ever notice that nothing takes as long as you think it will once you get started on it? That big mound of laundry that needs folding or the neglected closet that could use some organizing, is not as daunting once you dig in and get to work. I realized this and and found a new way to motivate myself to take on any task I was avoiding. Just set a timer for 15 minutes and jump into the dreaded chore that needs doing. When the time is up, just stop. When I did this, I found that it took away that feeling of being overwhelmed. Most of the time I even found that when my 15 minutes were up, I didn't want to stop; I was on a roll! Try this and soon you will find that we all have 15 minutes, no matter how busy or overwhelmed we feel at the start. Pick a place in the house that will make the most difference to you if it was cleaned up. For me that would be the island in the kitchen. When there is clutter left on that island, I feel like I can’t focus and the kitchen feels so messy. Set your timer, put on some music and go for fifteen minutes. If you want to stop when your time is up, stop. If you do this regularly you will find that your mood brightens when those unfinished projects are completed. That’s because clutter is stagnant energy and when you clear that clutter, you change the energy in your home and you. God made you beautiful on the outside, it's your job to make you beautiful on the inside. I used to say this to my boys as soon as they were old enough to understand. My sons are twins so they used to get a lot of attention when they were babies and were called "beautiful" and "handsome" often. It was flattering and nice to hear but I did not want them to think that was what it meant to be beautiful. I told them that their outsides, their looks, was something God given and they were not responsible for that part. Their insides, their soul, that is the part of themselves they had complete control of. Being a beautiful person meant saying “please” and “thank you”, smiling, sharing a treat, keeping your promises, being grateful for what you have and being kind. My boys are thirteen now and if you have teenagers, you know this is a time where growth spurts are happening, voices are cracking and acne is making its presence known. Not a recipe for gorgeous. temporary and does not define them. Taking the time to teach our kids what really matters is so important. It allows them to focus on what is truly meaningful and helps them see that they are in charge of creating what kind of person they want to be in the world. That is really beautiful, don’t you think? I know what you’re thinking: “Wait, what? It’s me who’s feeling bad right now,” right? Shifting your focus from how badly you feel to how great you just made someone else feel will result in a change in your mood. It’s normal to feel sad from time to time. It is part of life’s ebbs and flows. The peaches right now in Northern California are at their peak So, when we had some friends over last night, that was the first thing I thought about for my cheese board... juicy, ripe peaches. That's usually how I come up with my cheese or charcuterie boards... I just ask myself, What is in season and really delicious right now? Then I build around that flavor with other foods that will complement it and throw in some interesting textures for good measure. Sound complicated? It's easier than you think..
Let's do this together... First, start with a board that works with the type of event you're having - a fancy board for a fancy dinner, or a rustic one for a casual dinner. What I used last night is actually a wooden cutting board turned upside down! Perfectly casual and rustic. I knew that peaches had to be the star so I thought, 'What would go with a sweet and juicy peach?' It needs something that enhances that taste, like a salty cheese with some richness to balance the sweetness and acid of the fruit. 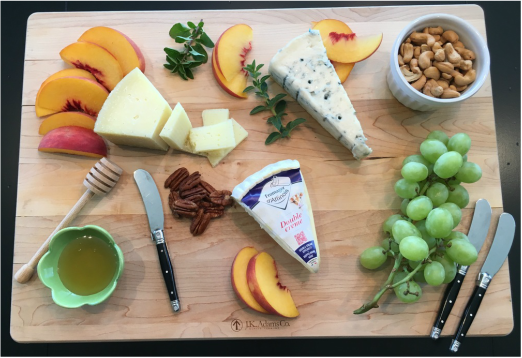 I used a Dolce Gorgonzola or a "sweet" Gorgonzola, which is an Italian Blue cheese that is more delicate and creamy than a traditional blue cheese and is the perfect counterpoint for the peaches. I also added honey to my board to further enhance the creamy cheese and create another layer of flavor to the peaches. Second thing to add to your board is some texture, like nuts or crispy crackers. Adding crunch to something creamy adds interest and makes a bite more interesting. Last night, I had cashews and pecans to add a crunchy texture to the board. Third, add another cheese with a different consistency for variety. Since the Gorgonzola Dolce is creamy, I opted for a harder cheese that is mild and plays well with fruit. 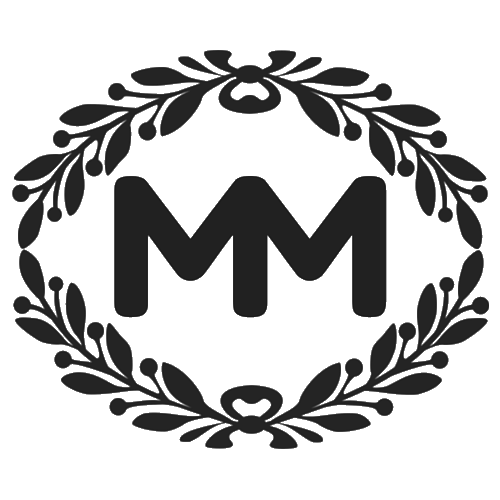 I chose Manchego which is a Spanish sheep's milk cheese that has a mild and nutty flavor. It is semi soft so it offers a different texture than the creamy Gorgonzola and keeps your board from becoming one note or one texture. That's it. Pick a seasonal fruit you want to highlight, then choose a main cheese that is the opposite flavor so it will show off your fruit. Add some texture with nuts, crackers or crusty bread. Those components will be the anchor to your cheese board. Add one or more cheeses that offer a different texture to your first cheese and you will have an interesting board that will be pleasing for your guests. What will you put on your cheese board this summer? Tell me in the comments section and please like this post! Happy eating! I asked my son this question while we were baking a coffee cake together this morning. I bake this same delicious sour cream coffee cake every Father’s Day ever since my husband became a father to our now 13 year old twins. As he whisked the eggs my son thought about this question and then said, "Traditions let you continue something you love to do again and again,". I thought about how every year my husband looks forward to this cake and how wonderful the kitchen smells as the cinnamon streusel smell wafts through the air. I looked at my sweet boy as he licked the batter and smiled at me. It's the same tradition but it changes a bit every year as my sons get older and can help me with the baking or express themselves in the cards they write to their Dad. I love the continuity that tradition provides us in a constantly changing world . As we celebrate Father's Day today, what are some of the traditions that observe every year? 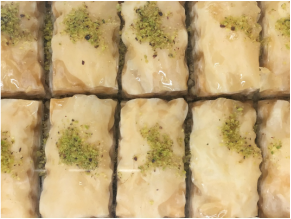 I took a field trip to Oasis Baklava in Belmont, California to get a special dessert for a party that my family is having in July. Oasis is a small family-operated bakery that's been around for over 35 years specializing in these Middle Eastern pastries. When I walked into the very unassuming brick building I was happily greeted by the owner, her daughter and the sights and smells of delicious pastries. Baklava means "many layers" in Farsi and is a Middle Eastern pastry made of layers of filo filled with chopped walnuts or pistachio and topped with a sugar syrup. I was invited to the taste baklava, as well as greibah, which is a lovely butter cookie that melts in your mouth. I wanted to have baklava as the main dessert for our event as an homage to my Mediterranean family and as a way to share some of my childhood memories with my guests. Oasis Baklava was absolutely delicious and I would highly recommend it. Have you ever looked at an old photo and thought, “I looked pretty good in this picture, why did I think I looked fat?" That’s exactly what happened to me this past weekend. I was looking at a picture of myself from four years ago, when my husband and I were celebrating our anniversary. I remember getting dressed for that dinner and thinking that I didn’t look so great. I wasn’t happy with my hair or my makeup. But, you know what? I did look pretty great! My dress looked nice even though I remember feeling “fat” at the time and that picture makes me smile when I look at it today. What if on that day I could have looked at myself with that same kindness and acceptance that I feel today when I look at that picture? What a wasted opportunity to feel good about myself and to take in that moment more fully! Bet you’ve done this to yourself too. What if you added up all those moments you berated yourself because you didn’t feel like you looked pretty enough, thin enough, whatever enough.. and just loved yourself and said 'I am beautiful right now'? "But I don’t feel beautiful," you say. Fair enough. What if you were just not so mean and instead noticed two good things about yourself in that moment? Something like, 'My lips look pretty with this shade of lipstick' or 'That dress is so cute on me'. You know what else would be good? What if you thought about the person or people you were going to be with and how much you are going to enjoy the time you spend together? Try to be in your life instead of in your head. When those negative thoughts come, just stop and think of two good things to say to yourself and do that again and again. This will soon spread into other areas of your life and you may start to realize that you’re not half bad at singing or that you're pretty damn good at walking lunges . Here’s what else will happen, you will be more empathetic to others. When I notice myself being more critical of other people, I know that I am being harsh and mean to myself. How can I look past your rumpled shirt and see your kind brown eyes if I am constantly picking myself apart? So, really, being kind to yourself is so unselfish that it's not even funny! It’s such a waste of time to have to wait to realize how you good you actually had something. I really wish I could have seen what was good about myself in the mirror that day while I was getting ready for my anniversary dinner. Who knows how much more I would have enjoyed that night, since I would have been more present to my husband and our lovely dinner? Don't waste any more time and silence your inner mean girl now.